A tasty closer look at this chic spot nestled inside The Joule in downtown Dallas. Let me start with two words: NUTELLA DONUTS. Now that you have had a chance to absorb those two words we can talk about brunch at Americano. Yes, it started with mimosas and housemade nutella filled donuts. I don't normally eat nutella, but I wanted a second donut- they were *that* good. Americano is worth a visit just for the donuts, but be sure to order extras because you will want more (trust me!). PS. Placecards were lettered by Chiara Marie Letters. After our we inhaled the nutella donuts, we shared a family-style brunch featuring Americano's Ciabatta French Toast, complete with almonds, lemon whipped ricotta, and cranberry maple syrup. If you have followed Dallas Blogger Brunch for any length of time, you know by now that I am a fan of french toast; some would even say I am a connoisseur of this brunch favorite. It's true, I order the french toast at every restaurant we visit, and I was not disappointed by Americano's fruity take on this classic dish! The cranberry maple syrup was what put this toast over the top- I highly recommend it! 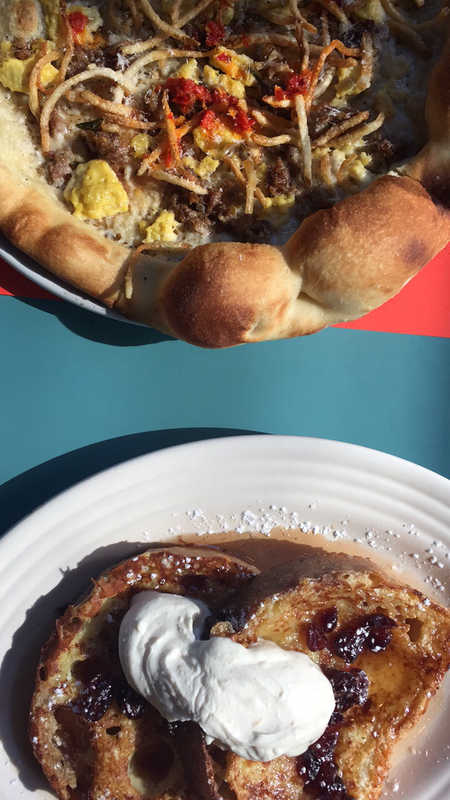 Now let's talk about this breakfast pizza... sausage gravy, farm egg, and potatoes had us ready to devour this pizza as soon as it hit the table! We also feasted on an egg white frittata with seasonal greens, marinated tomatoes, and arugula salad. Everything we ate was delicious and the waitstaff was very attentive, making the whole brunch extremely enjoyable. Two more reasons I loved brunch at Americano: complimentary valet parking (who has time to find parking downtown!) and they take reservations via OpenTable. 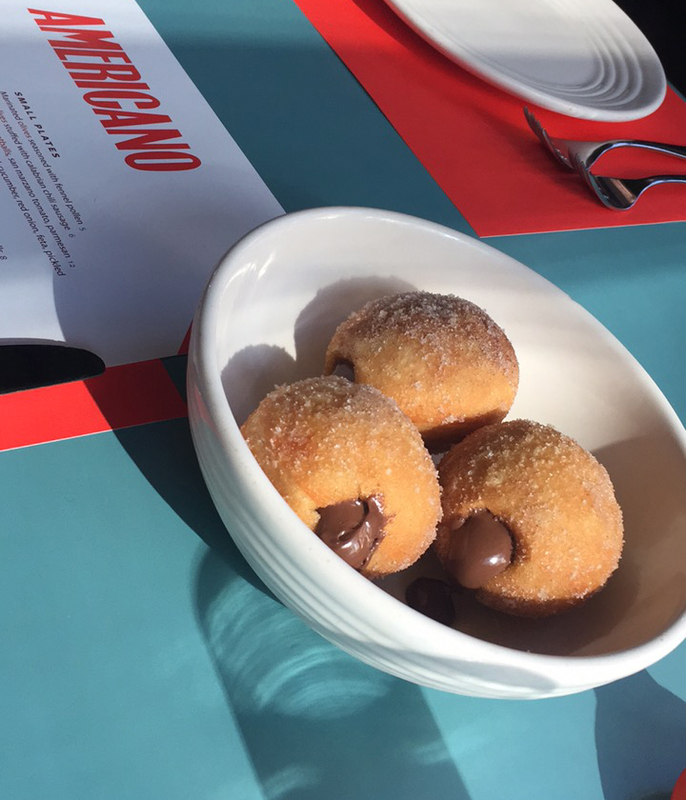 I actually made reservations to visit Americano again for round 2 of nutella donuts the week following this brunch! 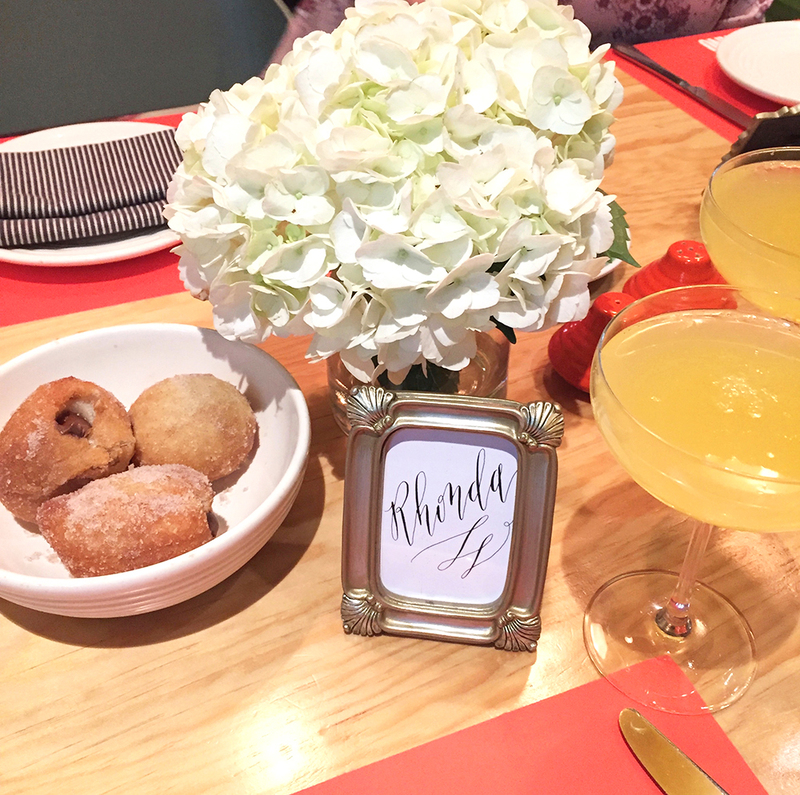 Thank you to Americano for hosting January's Dallas Blogger Brunch! Thank you to Chiara Marie Letters for our place cards!